You might say it is a case of "self-control" involving the test of a stem cell therapy for an infamous and terrible disease. Not self-control in the usual sense, but in the sense of controls during a clinical trial for a treatment prior to its release to the general public. 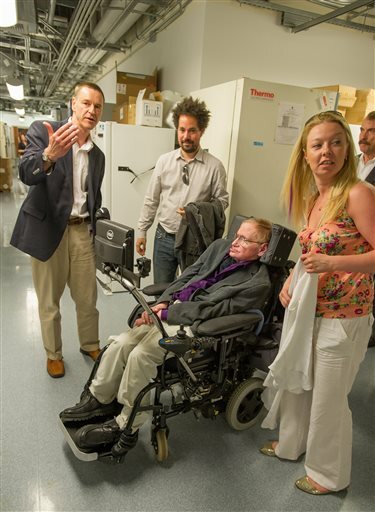 by famed physicist Stephen Hawking (seated), who . The key scientist involved in the trial is Clive Svendsen at Cedars-Sinai in Los Angeles. He and his team have just received the federal go-ahead for the test of a therapy for amyotrophic lateral sclerosis, commonly known as Lou Gehrig's disease. Approval came after a 4,600-page application was submitted. Research leading to the trial has been heavily funded by California's $3 billion stem cell agency. About $17 million has been awarded to Svendsen related to the project, which is tackling what is a truly frightful affliction. "People with ALS lose the ability to speak, eat, move and finally, breathe. The average life expectancy after diagnosis is just 3 – 4 years. It’s considered an orphan disease because it affects only around 30,000 people in the US; but even with those relatively low numbers that means that every 90 minutes someone in the US is diagnosed with ALS, and every 90 minutes someone in the US dies of ALS." Normally in clinical trials, a treatment is tested on two groups of patient. One group receives the treatment. The other, control group does not,. McCormack explained how Svendsen's trial will work. "In this clinical trial the patients will serve as their own control group. Previous studies have shown that the rate of deterioration of muscle movement in the legs of a person with ALS is the same for both legs. So Svendsen and his team will inject specially engineered stem cells into a portion of the spine that controls movement on just one side of the body. Neither the patient nor the physician will know which side has received the cells. This enables the researchers to determine if the treated leg is deteriorating at a slower rate than the untreated leg." “The disease affects around 30,000 people in the US, too small a number to make it economically viable for many companies to develop a treatment. Fortunately, the people of California created CIRM to get around problems like that. Our goal is not to make money. Our goal is to save lives." "The stem cell implantations for ALS patients involved in the clinical trial could begin by the end of the year, Svendsen said. Participants will come from the ALS Clinic at Cedars-Sinai, and the trial will be led by Robert Baloh, MD, PhD, and Peggy Allred, PT, DPT. The neurosurgical team will be led by J. Patrick Johnson, MD, MS."
The California stem cell agency on Wednesday completed creation of a $30 million effort to dramatically speed approval of stem cell therapies and establish the Golden State globally in the much-heralded regenerative medicine field. Dubbed the “pitching machine,” the two-part program is designed to pick up where basic stem cell research leaves off and to accelerate it through the all-important clinical trials involving humans. Such trials are required prior to widespread use of a therapy by the public and generally take years. 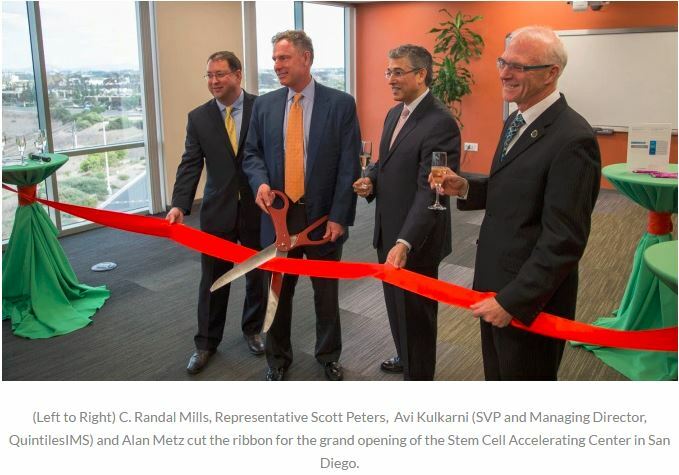 With no debate, no questions and no discussion Wednesday, the governing board of the stem cell agency unanimously approved a $15 million award to QuintilesIMS in San Diego to help move basic research into clinical trials. The effective decision, however, was made Oct. 4 during a closed-door meeting of the agency’s scientific reviewers, who gave the proposal a score of 89 out of 100. The other half of the pitching machine was an additional $15 million award to Quintiles, which formally began operations this month. Quintiles is a publicly traded, multinational firm based in Durham, N.C., that deals with “information and technology solutions” in health care. C. Randal Mills, president of the $3 billion stem cell agency officially known as the California Institute for Regenerative Medicine, said the pitching machine is likely to be the most significant achievement of the state’s 12-year-old research effort. CIRM’s contracts with Quintiles call for the $30 million to be spent in California. California voters created the state’s stem cell agency in 2004 following a ballot initiative in which voters were told that stem cell cures were nearly at hand. The agency has yet to finance research that has produced a therapy that is available for widespread use. Quintiles’ responsibilities will include pharmacology and toxicology studies along with manufacturing stem cell and gene-modified stem cell products. The company will also provide clinical trial operations and management services as well as data management, and biostatistical and analytical services. CIRM’s contracts with Quintiles are for five years. The effort will also feed into the agency’s Alpha Clinics, a $34 million program to intensify focus on stem cell treatments and to contribute to California’s global position in the stem cell field. The agency said Wednesday’s action will create “the first center in the world designed specifically to overcome the unique challenge of manufacturing, safety testing and other activities needed to successfully apply” to start a stem cell clinical trial. One clinical trial that launched in 2010 required submission of 22,000 pages of information to the FDA. CIRM is involved in 19 active clinical trials. It is projecting its participation in about 50 more before 2020, when its funding is scheduled to run out. No additional source of funding has been secured. The ongoing tale of pigs, people and their organs moved along during the weekend with a fresh chapter about a Spaniard and the Salk Institute in La Jolla, Ca. 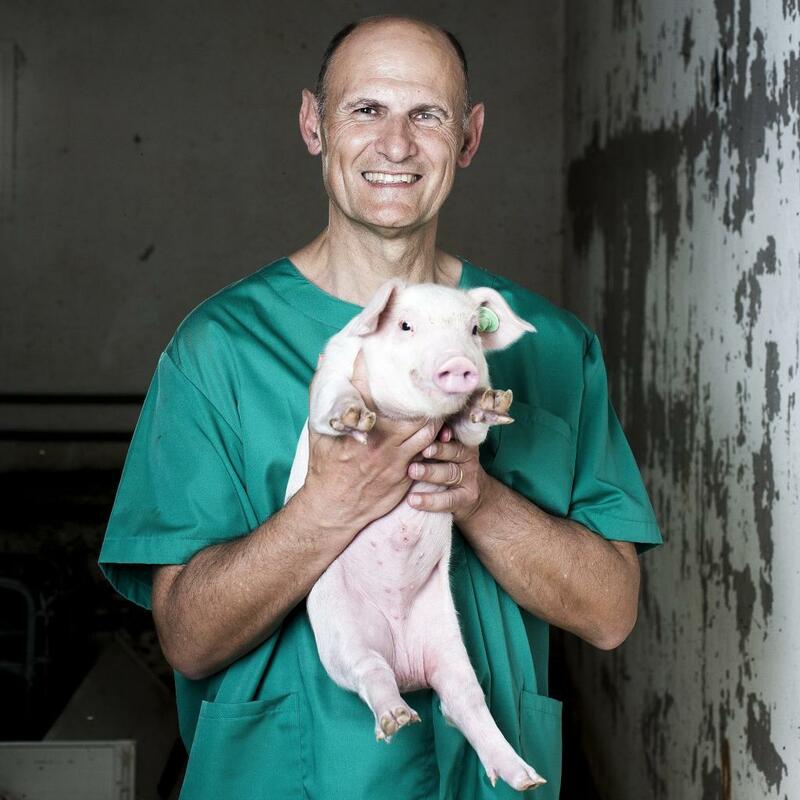 Reporter Bradley Fikes wrote a lengthy piece in the San Diego Union-Tribune dealing with Juan Carlos Izpisúa Belmonte and his quest to grow human organs in pigs. Izpisúa Belmonte has a lab at Salk and another in Spain. Fikes reported that the researcher received a $2.5 million award from the National Institutes of Health last week "to advance his research with monkey cells implanted into pig embryos." "Since monkeys are biologically similar to humans, analysis of pig-monkey chimeras should yield insights that can be applied to eventual production of human organs, he said. And unlike mice, pigs are large enough to grow usable human organs." In Spain, Fikes said, Izpisua Belmonte is forging ahead at the same time with human-pig work. The research is touchy for obvious reasons. But Fikes wrote that "the shortage of organs that causes nearly two dozen Americans — and many others around the world — to die each day while awaiting a transplant." "After years of experiments, in 2015 his team reported success in coaxing a newly identified type of human stem cell to not only live in mouse embryos, but also integrate into the embryos’ structure. Those embryos weren’t allowed to develop further because of U.S. regulations." Izpisúa Belmonte has received $6.5 million in three awards from the California stem cell agency, but none of those grants are currently active. and accelerating centers. Discovery is basic research. California's stem cell agency next week is set to approve the second part of a $30 million "pitching machine" aimed at accelerating stem cell research and translating it into therapies that can save people's lives. An as yet-to-be-identified organization will receive $15 million under the proposal (INFR2-09298) to be considered publicly by the full board of the California Institute for Regenerative Medicine (CIRM), as the Oakland-based state agency is formally known. The plan has already been enthusiastically endorsed by CIRM's out-of-state scientific reviewers who gave it a score of 89 out of 100 in a closed-door session, according to a CIRM summary of the review. The CIRM board almost never overturns a decision by its reviewers. A competing proposal (INFR2-09233), also considered behind closed doors, was rejected by reviewers. They gave it a score of less than 60, declaring that the application did not focus on the agency's objectives but rather on the unidentified applicant's proprietary technology. The "pitching machine" description came from Randy Mills, president of the stem cell agency, who last December told the CIRM board last December that the agency should dramatically reduce the number of years it takes for a stem cell therapy to reach patients. San Diego. Speaking at the ceremonies for the opening, Mills said the intent was to create "a center for the world’s most brilliant researchers and innovators in cell therapy that gives them the tools they need to successfully navigate this regulatory system." The agency said Quintiles will provide support and management services that scientists need to boost the chances that their clinical trials will be successful. Conventional clinical trials can have a 90 percent failure rate. The presumption is that stem cell clinical trials, which are relatively new, are likely to have a higher failure rate. The $15 million award next week will create a translating center to work with the accelerating center being run by Quintiles. "There's a lot of opportunity in this translational phase for us to go after. We can literally cut this phase in half. So the research centers are excited about it, and the FDA was excited about it, and I was excited about it. And that's a very, very unusual trinity to have." "Our ultimate goal is to empower the translating center and other elements of CIRM infrastructure to become the premier enabler of cell based therapies to patients in California and worldwide." The winner of the translating center award will have to start work by early December under the terms of the award. Next week's one-hour board meeting will be held telephonically with locations from which the public can participate in Oakland, San Diego, Napa, Fresno, Santa Barbara, Los Gatos, Sacramento, Irvine and San Francisco. The session will be audiocast online and via an 800 number. Addresses and directions can be found on the agenda. One of the great abominations of our time -- at least in the view of this curmudgeonly writer -- is the nearly endless list of "special days" that seem to parade without stop throughout the year. I take that back. The list is not nearly endless. A web site called Track Maven has counted something like 2,300 "special" or "national" days. And -- most importantly -- the list does not include today, Oct. 12, as Stem Cell Awareness Day. This year, according to the quasi-official list, today, Oct. 12, is actually limited to marking the following occasions: National Free Thought Day, National Farmer’s Day, National Gumbo Day, National Fossil Day (Wednesday of second full week in October), National Emergency Nurse’s Day (second Wednesday in October), National Bring-Your-Teddy Bear-to-Work/School Day (second Wednesday in October) and National Stop Bullying Day (second Wednesday in October). Stem cells are quite clearly missing from the entire Track Maven list. There is a National Brisket Day (May 28), National Cabbage Day (Feb. 17), National Public Sleeping Day (Feb. 28), National Absinthe Day (March 5) and National Get-Over-It Day (March 9). But definitely no stem cell day. So why is the California Stem Cell Report writing about this when there are so many more important things to discuss? Because California's $3 billion stem cell agency conjured up its Stem Cell Awareness Day a few years back and can't seem to shake loose of the concept. The reality of these not-so-special days is that they originate as a feeble tool of public relations practitioners to appear to gin up some attention for the clients and pad out an invoice. The most effective thing the special days do is fill the mail boxes of the running dogs of the media, who pitch them in the trash without even opening the envelope or the email. 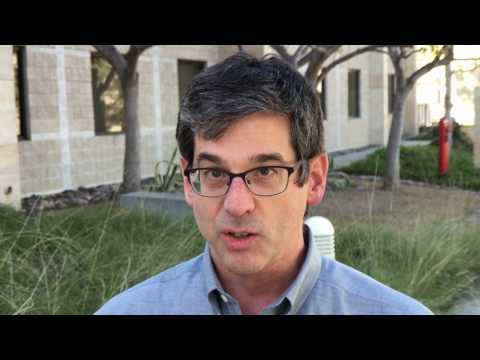 That said, UC Davis stem cell researcher Paul Knoepfler bit on the ploy. He actually put together a useful overview on his blog of the state of the stem cell arena, albeit tilted toward the optimistic. Meanwhile, today this curmudgeon is going to celebrate National Grouch Day, which is supposed to be on this Saturday but is going to be extended this year to a four-day holiday by unanimous consent. It was an interesting juxtaposition today on Twitter -- a vision of stem cell hope vs. a reality check. The apparent contradiction is not uncommon in health science news. It is a variation of the glass half-full or half-empty expression. But the stakes are not trivial. They involve deep emotions and the finances of the patients who face decades of impairment and death. The perspectives also involve the mindsets of researchers and entities such as the $3 billion California stem cell agency. It has been wrestling for 12 years with the problem of producing a viable stem cell therapy for any sort of affliction. Its funds could well run out -- as expected in about three years -- with no cure to demonstrate for California voters who created the program in 2004. Should the agency and researchers surrender because the task is enormous and is likely not to bear real fruit during their lifetimes? Should they move on -- if they could -- to something that would provide a more immediate, major public health benefit. Can or should taxpayers support what some might call dreamy scientific aspirations while the state could use the billions to improve education and daily medical care for the poor? Some may be able to come up with firm, black-and-white answers to these sort of policy and personal -- at least for researchers -- questions. This writer cannot. As for the agency, its funds are legally locked for stem cell research or something akin to it. All the agency can do is spend the money well in that area -- a restriction approved by voters in the ballot initiative process. A California scientist has plunged into the jungle of 4,000-plus comments dealing with the federal government's proposal to change regulation of stem cell research and has discovered an intense sense of ownership on the part of many. "In fact more than 700 use the exact same phrase 'My cells are MY cells' and it looks like hundreds more comments have the exact same or similar language is used in more extensive forms. 'My cells are my property.' 'My cells are mine.'" "Keep your hands off my cells!" "It would seem the point is that these particular commenters believe that cells taken from their bodies should not be regulated as drugs under any circumstances. "Everyone is of course entitled to their own opinion, but cells can be drugs if they are changed or used in ways that are not homologous because these factors make them have higher risk to patients. To ask for cells to never be regulated as drugs is asking for chaos and many harms to patients, but people may not realize that." California's $3 billion stem cell agency is among those seeking changes in the FDA guidelines. The FDA has not set a public timetable for action on new rules, which Knoepfler and others have said are needed to deal with "an out-of-control, direct-to-consumer stem cell clinic industry."